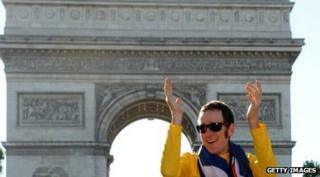 Sir Bradley Wiggins says he will not be competing in this year's Tour de France cycle race "as things stand". The 34-year-old won the Tour in 2012, but didn't take part last year as fellow Briton and Team Sky colleague Chris Froome triumphed. On BBC Breakfast, he said: "The team is focused around Chris Froome. "I am gutted. I feel I am in the form I was two years ago... Cycling's a team sport and all about Team Sky winning and Chris is defending champion." In the Tour de France, teams of cyclists compete, but they support their main rider who they think is most likely to win the race. 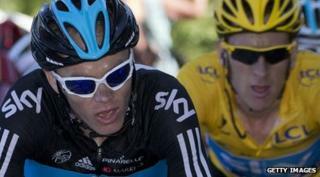 This year Team Sky have chosen Chris Froome as that main rider, making Wiggins unlikely to win. Wiggins and Froome have had arguments in the past and have a difficult relationship. The pair fell out during the 2012 Tour, when Froome appeared to disobey his team orders by pulling away from Wiggins on one of the stages. Wiggins, who won gold in the time trial in the London 2012 Olympic Games, had planned to switch back to track cycling at the end of this season to try and compete at the 2016 Olympics in Rio. But he said: "Having missed the Tour again this year, I wouldn't like to leave it there. I'd love to go back at some point so there is the chance that I would go back to the Tour next year." Wiggins has already won three Olympic gold medals on the track - the individual pursuit at Athens 2004 and both the individual and team pursuit at Beijing 2008.